AWRC Pro - Easily manage remote servers and workstations, without remote software installs. AWRCP (Atelier Web Remote Commander PRO) is a much boosted edition of our flagship product, now more than 10 years old (AWRC). AWRCP adds important features users have been requesting for years, namely capability to record sessions, can access and control RDP/TS sessions, unicode support, 64-bit remote access to 64-bit computers, more detailed information about running processes, listing of installed programs and others (more than 100 additions). Of course, AWRCP does everything its ancestor does, just does it better and faster. You don't need to install any software on the remote to run AWRCP in there. This turns the software particularly useful for accessing remote machines without any previous preparation. AWRCP has all sorts of tools for remote management, audit and help, still we keep adding new tools all the time as if AWRCP were not already the most feature-rich tool you can find. This download (awrcp.zip) was tested thoroughly and was found 100% clean. Click "Report Spyware" link on the top if you found this software contains any form of malware, including but not limited to: spyware, viruses, trojans and backdoors. 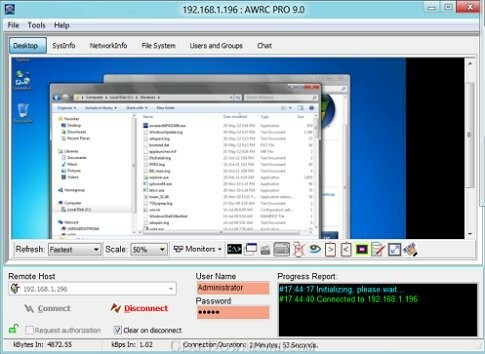 AWRC Pro 10.4 - Easily manage remote servers and workstations, without remote software installs.